Call or Visit SignatureCare Emergency Center – Open 24 Hours! SignatureCare Emergency Center gives you peace of mind when you have a medical emergency. Our emergency rooms are located in local neighborhood communities. We are open 24/7 for emergency room needs. Our emergency rooms and board- certified doctors treat adults and children. We have ambulance service available if you cannot drive. Call one of our emergency rooms for more information. SignatureCare Emergency Center – Open 24 Hours! 1. Will I see a Physician or a Physician’s Assistant? When you visit SignatureCare Emergency Center ER, you can be sure that you will only be seen and treated by highly trained, board-certified, experienced emergency care physicians. Additionally, our doctors will take their time to discuss your health problems and answer any questions you may have pertaining to your treatment options. You will never be rushed at our ER locations! 2. Do you provide medical services for Children and Infants? Our freestanding emergency rooms are fully equipped to provide emergency care to people of any age including children and infants. We know that children often become frightened in emergency situations, and our staff and physicians are trained to provide personalized care services to children and alleviate their fears. 3. 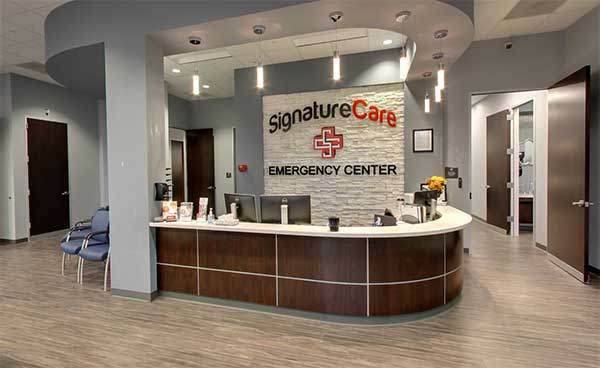 How is SignatureCare Emergency Center different than traditional Hospital Emergency Rooms? Just like traditional hospital emergency rooms, we offer emergency services every hour of the day and night. However, unlike regular ERs where you often have to wait hours to obtain treatment, there are no long waiting times when you visit us. In fact, our facility boasts waiting times of only 10 minutes or less! 4. What if I need to stay in the Hospital? If your illness or injuries require you to remain in the hospital for observation, our trained staff can quickly and easily transfer you to a top-quality local hospital. We will handle all of the necessary arrangements to transfer you to a hospital of your choice with as little stress as possible. 5. What if I have questions about my Bill? If you are like many other people today, you may have questions concerning your medical bills or insurance claims. If so, simply give us a call, and we will do everything we can to answer any inquiries you may have. We look forward to serving you! 6. What is a Freestanding Emergency Room? Basically, a freestanding emergency room is an emergency center that provides emergency care services, emergency medications, laboratory services, CT scans and x-rays in a facility that is not part of a hospital. The staff in freestanding emergency rooms is board-certified and fully trained in emergency care. 7. Is SignatureCare Emergency Center more expensive than a traditional Emergency Room? Our emergency room charges are typically the same as other freestanding or traditional emergency rooms. However, you need to be aware that most insurance plans have separate co-pay structures for visits to emergency rooms, and fees may be higher than those associated with urgent care visits or visits to a doctor’s office. If you have any questions pertaining to insurance co-pays, we ask that you speak with your insurance company’s customer service representative. 8. What do I need to bring with me to the ER? When you visit our location, make sure you bring your driver’s license or photo ID and a method of payment such as your insurance card. If time allows, other things you will want to bring with you include a list of any medications you are taking, a list of medical conditions you suffer from, the name of your physician and a list of any locations you have traveled to recently. 9. Does SignatureCare Emergency Center provide everything a Hospital Emergency Room can? SignatureCare Emergency Center is able to provide all of the same care and treatment that a hospital emergency room can. However, we can provide care much quicker and with more personalized attention. We have an in-house laboratory that is capable of performing everything from routine analysis to complicated testing. We also have a state-of-the-art imaging center that uses modern machinery including x-rays, ultrasounds, and CT scans. 10. Do I need to make an appointment? There is no need to make an appointment to seek treatment from our team. We offer treatment to patients every hour of the day and night, and we are even open on weekends and holidays. Furthermore, any necessary testing is done promptly onsite. The only time you may need to make an appointment is when an outpatient imaging is required. However, we do offer the option of scheduling your appointment in advance to eliminate wait times completely. 11. What is considered a medical emergency? A medical emergency is defined as a situation in which the patient feels that their symptoms are severe enough to do them harm. This is known as a “prudent layperson’s standard”. In short, if you are concerned about the severity of your symptoms, you can be treated at SignatureCare Emergency Center. Even symptoms that may seem minor at the onset can indicate a serious underlying condition. Urgent care centers are much like doctor’s offices with the exception that they offer extended hours. Additionally, these types of facilities are typically staffed with nurses or doctors who may not be trained in emergency care treatment. Our freestanding emergency center, on the other hand, is staffed with board-certified emergency room doctors who can handle any type of emergency including ones that are life-threatening. 13. How do I know if SignatureCare Emergency Center accepts my insurance? We accept all major forms of insurance except Medicare, Medicaid, and Tricare. If your insurance is not associated with one of these we accept it. You can always call or visit any of our emergency rooms for more information. 14. How does SignatureCare Emergency Center handle patients without insurance? Upon visiting us, you will receive what is known as a medical screening. If the screening determines that you are experiencing a life-threatening emergency, we will treat you. However, if the screening determines that your condition can be treated in a non-emergency setting and you do not have insurance, you will either be given a referral or the option to self-pay. If you do not have insurance and wish to be treated at SignatureCare Emergency Center, you will be given the option to self-pay. If you choose this option, you can pay your bill using cash, credit card or check.